It can be occasionally tempting to pepper articles with hyperbolic language like ‘institution’ and ‘unmissable’. If those words are missing here it is not because Bendl is unworthy of such superlatives; just that they can seem worn out and clichéd. Bendl ranks as highly as any bar on this website, and you can be guaranteed not only of having fun but also of experiencing something typically Viennese as well. For people (particularly Brits and the Irish) who have forgotten what the world was like before the smoking ban came in, Bendl will act as a stark reminder. It is what is known as a Rauchlokal – a ‘smoking pub’. And it’s damn smoky; my advice: don’t wear a washed sweater. Another interesting thing that happens in there is that around 23:00 people start chucking beer mats at one another. There’s no reason for this but if you go there, you seem to always find yourself engaged in an all-out beer mat war. It is a random exercise. I have yet to meet someone who can accurately guide one to a target, which is probably why everyone gets involved. 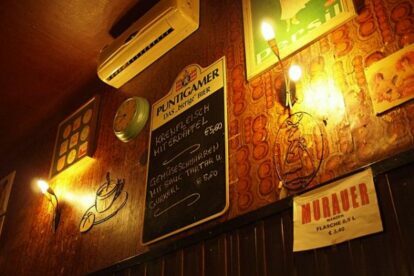 Bendl has been, since it opened in the ’70s, a well-known and well-loved – indeed, one of the best – small bars in Vienna. It is famous for being a bar in which students can rub shoulders with philosophers, and artists with stammgäste. And it’s just a stone’s throw from the U2, Rathaus, the number 2 tram and the city centre. What are you waiting for?